I am pretty much a music nut and being able to bring it with me everywhere is getting easier and easier. Bringing tunes into the back-country has always been a challenge though. Electronics plus dirt and water never mix well. So I encase my iPhone in a weatherproof, bombproof plastic fortress to protect it. But this does make listening to The Black Keys while I paddle a bit tough, until now. 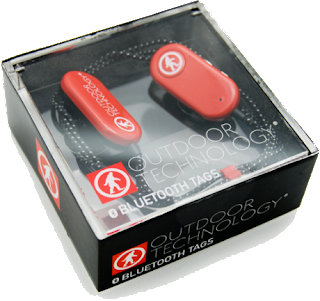 The Bluetooth Tags from Outdoor Technology are the solve to my situation. I can hit play on my iPod, lock the thing up tight, stow it away in my pack and listen "wirelessly" from up to 45 feet from the source. I say "wirelessly" because even thought the ear buds are not tethered to the iPod with a wire, the two buds themselves are connected to each other by a wire. That said, they literally change how you think about headphones. With the wire running around the back of my neck while in use, the odds of getting tangled in it is nearly zero. With controls for volume and playback as well as a microphone and call answering capabilities, taking the actual iPod outta my pocket is almost never necessary. Whether you are mowing the grass, shredding a mountain or putting miles on your bike, the benefits of being able to stash your phone/iPod anywhere and still use it just plain rules. The sound quality is really good. We are not talking DJ headphone quality, but they will rival just about any buds I have ever tried. They come with three different pairs of pads for the tips of the buds, so you can tailor them to fit your ear. They stay in place well, and add in the over-the-ear sport clips and they are going nowhere. On the downside, you do kinda look like "Mr. Bluetooth Guy" waiting for the power conference call while you are in line for the chairlift. But once I got past that, I was back in love with these things. When not in use the tags hang around your neck and resemble a pair of dog tags, thus the name. I have to admit, I wear them like this all the time and I never seem to lose them, which is NOT NORMAL.